4.2 metre “Smartwave” boat. 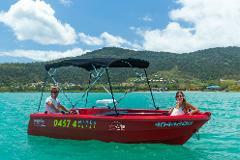 The self-drive hire boats have a 10hp Honda 4 stroke motor and are available for half or full day hires. Max 5 people.